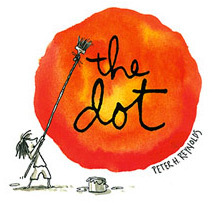 Teaching Authors--6 Children's Authors Who Also Teach Writing: A Favorite Jeanne Marie Post, Monarchs, and International Dot Day! A Favorite Jeanne Marie Post, Monarchs, and International Dot Day! Yes, I can identify. As I write this, I’m baking homemade granola (and oh, does it smell good! I substituted almond extract for the vanilla called for in the recipe), keeping one ear tuned to the dog in the backyard, and periodically looking for migrating hummingbirds on the feeder outside the window in front of me—all positive endeavors, a refreshing change from winter and spring! After spending much of my summer observing, photographing, and writing about monarch eggs, caterpillars, and butterflies, today I released the last butterfly, which popped out of its chrysalis inside the protective mosquito net tent in our backyard. In its honor, I’ve written a new monarch poem. The old monarch tent, tattered and holey from some unknown attacker, has probably reached the end of its usefulness. Although I hate to toss it, I think it’s time. And so we move on. Today feels like autumn: cool weather has finally returned to Wisconsin (look at those clouds! ), fall classes are in full swing, and I’m working on several promising manuscripts while outlining a new nonfiction educational series. I detect a sense of determination in the air. Wish me luck! Then go make your mark! This week’s Poetry Friday Roundup is at Teach Mentor Texts. Lovely picture and poem! We raise Monarchs every year, but this year we've only found two caterpillars all summer, and no eggs. We're very worried about the population. Great to have you back, JA! And I love both the picture and poem, too. Thank you, Marti and Sheila Ruth! Yes, I'm worried about monarchs, too. We seem to see fewer each year. A great site for tons of monarch info is http://www.monarchwatch.org/ Enjoy! Each season has its own rhythms and I think one of the hardest things for me is taking time for what I know I need to keep me grounded. Thanks for the reminder to look at the details! I enjoyed your poem and picture of the monarch. that must be so amazing - to see them turn from caterpillar to butterfly. Simply amazing! Thanks for the information on Dot Day as well! Myra from GatheringBooks, yes, I'm happy to be in such good company! Keri, I'm with you! Making time to get outside every day is becoming more of a priority each year. Kenda, thanks! How I'd love to see more of the monarch migration someday! BJ, thanks to you, too! I agree, the monarch transformation is an amazing sight to see! I'm glad we had at least a few to watch this year. New Beginnings--Welcome Back, JoAnn Early Macken!